As a giddy rootwoman, I love working with all kinds of plants but my first magickal love has always been flowers. There’s just something special about their appearance, scent, and energy that helps reconnect and ground me when I can’t seem to focus or find myself experiencing a massive anxiety attack. I am all about flower power!!! I love exploring all of the wonderful methods of keeping plant spirits close to me throughout the year which is how I came upon my gleeful obsession with flower essences, flower pressing, and finding cookbooks that feature entrees bursting with flower magick! The winter months when most plant life is lying dormant and getting some much deserved rest is the time when I seem to need the companionship offered by my floral allies the most. Making flower and stone infused salt during the growing season is a surefire way for me to always have a way to infuse floral magick into whatever spells I’m casting no matter what season it is! Lay a single layer of your flowers over the top of the salt. Cram as many flowers as your heart desires being very mindful to not overlap them. Add another layer of sea salt on top of your flowers making sure to completely cover them with at least 1/2-1 inch of salt. With the last of your flower companions create a magickal pattern formation and lay your gemstone/crystal in the dead center. Cover and store in a dark cool place. Let it charge for a least one month. You will know that your flower and stone infused salt is ready when the flowers that are completely dry and brittle. Sometimes parts of the salt will have dried in clumps but it should be relatively easy to break the salt back up into the desired consistency again. I like leaving the dried flowers in the salt but you can strain them out and save them for other uses later. When you’re done admiring the beautiful magick you’ve created place your infused salt in a moisure proof container until you’re ready to use! -Make sure that the stone/crystal that you will is compatible with salt. I had to learn the hard way that there are some crystals (turquiose, malachite, moonstones, and opal to name a few) that actually have a very adverse reaction when paired with salt. -If you will be including the salt in spells and potions that will come in contact with skin and/or will be ingested, choose flowers that are safe for those corresponding uses. Moonlight however is always welcome! -Incorporating moon phases into when you make your salt is a wonderful way to add a complex lunar layer to your spell! What if a month later the flowers still aren’t dry? This has happened to me when I got punch drunk with the flower layering..lol! 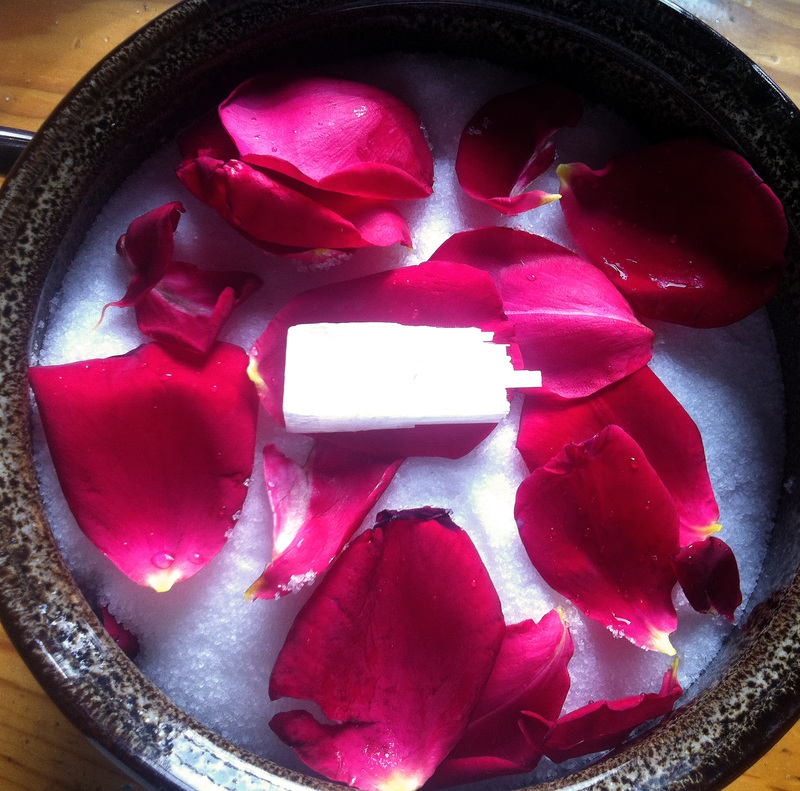 Simply remove the crystal from the top layer and stir the salt and flowers up thoroughly making sure that . I know that it will completely mess up the beautiful layers that you’ve created but we want to ensure that all of the flowers are completely dry before using. Be sure to break up the clumps and add more salt if you feel the mixture is too moist. I would err on the side on caution and throw the batch away. Make sure to take copious notes on what went wrong. Was it stored someplace that was humid? Did the lid get knocked off and water find a way in? Mistakes are a part of the learning process so be gentle on yourself! It doesn’t have enough or any of the flower scent I was hoping for! This can sometimes happen depending on the type of flower being used but rest assured the flower’s magick is in there! You can always add a little essential or fragrance oil if you’d like. Can I use flowers from the store or the side of the road? Unless it’s specifically labelled as organic, I would not use store bought flowers due to the high amount of pesticides and artificial colorants that are used. I would recommend against using flowers found alongside busy roads due to the high level of toxins (both chemical and emotional) they can absorb from the high flow of traffic they are exposed to. HAVE FUN AND HAPPY HOODOO-ING!